Celebrate the brotherhood of any program with this enamel recovery medallion. 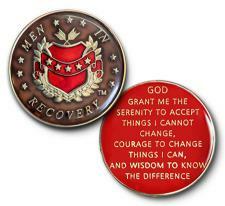 The front represents a Red Shield with the words - Men In Recovery. The Serenity Prayer is on the backside of the medallion.